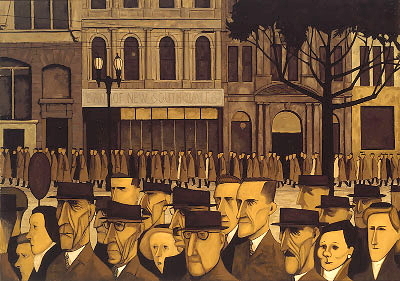 John Brack was one of Australia's most outstanding artists, was born in Melbourne in 1920, and his work first achieved prominence in the 1950s. Having painted thousands of paintings, he is best known for two special paintings in the eyes of Melburnians.. the iconic Collins Street, 5 pm (above) and The Bar. For over forty years he was at the forefront of Australian art and produced some of our most iconic images. More than any other Australian artist of his generation, Brack was a painter of modern life - its starkness, its shadows and its brooding self-reflection. His work is characterised by a kind of caustic realism and a strong sense of alienation, undercut with dry, sardonic humour. His style evolved into one of simplified, almost stark, shapes and areas of deliberately drab colour, often featuring large areas of brown. He made an initial mark in the 1950's with works on then contemporary Australian culture, such as the iconic Collins Street, 5 pm (1955), a view of rush hour in post-war Melbourne. Set in a bleak palette of browns and greys, it was a comment on the conformity of everyday life, with all figures looking almost identical. This painting was named 'Melbourne's Favourite Painting' in the 150 NGV Anniversary painting competition. A related painting The Bar (1954) was modelled on Manet's A Bar at the Folies-Berg�re, and satirised the Six o'clock swill, a social ritual arising from the early closing of Australian bars. Most of these early paintings and drawings were unmistakably satirical comments against the Australian Dream, either being set in the newly expanding post-war suburbia or taking the life of those who lived there as their subject matter. John Brack | 10 May 1920 - 11 February 1999 in South Melbourne, Victoria. For someone so expert at capturing the human condition, we know surprisingly little about Victorian artist John Brack. Picture this. It's the early 1960's and John Brack, head of painting oat the National Gallery School, has finished for the day. So he buttons his jacket, furls his umbrella and wanders down Swanston Street past Foy and Gibson department store, past the town hall, towards Flinders Street station. But before catching his train out to suburban Surrey Hills, Brack stops in at the Cathedral Hotel in Flinders Lane. At this waterhole for office workers, he likes to order a beer and discuss anything and everything with colleagues. Gallery gossip, poetry, the latest crime novel he's read . . .
"John was very sociable with a drink in his hand," artist Murray Walker recalls. "A good conversationalists who could always draw people out. But he was a good listener too." Brack missed nothing. The way people sounded, looked and behaved: this skilful artist recorded what he heard, saw and felt in paintings such as The Bar and Collins Street 5pm. But his acute readings of modern life were present too, in his studio nudes and still lifes, in his ballroom dancers and tubular mannikins. "If I choose to paint life I see around me, it's because I find people more interesting than things," he explained. A new NGV exhibition confirms Brack's "fundamental interest in the human condition" and invites us to look again at "the most highly prized and sought after Australian artist on the art market". But after inspecting more than 150 paintings and works on paper in the "John Brack" show, are we any wiser about the man? "He was rather complex," curator Kirsty Grant admits. Her monograph in the exhibition catalogue details the way he worked and thought. In another essay, Helen Brack illuminates her late husband's oeuvre. For a personal portrait, however, one needs to hear first-hand from Brack's friends. Such as artist Jan Senbergs. "John appeared to be severe," he says. "But when you got to know him, well...he was many things. A man who showed what an artist could be." Walker, a Gallery School colleague, agrees. "John was very clear-minded," he says, "an intellectual with the sort of mind that would take no prisoners. But he had a very kind heart and was generous to his friends, to his students. What he knew, he would share." Artist Rick Amor, one of Brack's students in the mid-60's, confirms this: "John's great strength was his intelligence. He used to say pictures are made with your brain and would talk about them being like an onion with layers of meaning. He also stressed the idea that you remained independent as an artist, that you didn't try to be anything but yourself." Brack, the son of working-class parents, was a loner by nature. Growing up in Hawthorn East "without pictures, without music", he discovered poetry and paintings for himself in the Reading Room of the State Library. Inspired by modern art, he enrolled in evening classes at the National Gallery School, where he honed his technical skill. After war interrupted his studies, he returned as a mature student and worked towards an ironic style. His line was scalpel-sharp. His theme? Every day existence. "John told me, when he started to paint, that art was terribly serious," Amor says. "So it seemed logical to him to do something witty and ironic." The National Gallery of Victoria was quick to recognise Brack's singular talent and bought Collins Street 5pm in 1956. "I do not try to paint 'popular' pictures," the artist told gallery director Eric Westbrook. No problem there. Modern painting mattered to few Melburnians in the '50's, so Brack got by teaching art at Melbourne Grammar School, giving CAE lectures and writing occasional art criticism. In 1962 Brack was appointed head of the National Gallery School and swept a broom through the place. Walker was one of several new appointments and taught etching at the school from 1964. "You would always be learning with John," he says. "A whole range of artists were coming and going because of his connections. And on Wednesdays, he would give these wonderful lectures on art history." Brack urged his listeners to look at great art - Nicolas Poussin's The Crossing of the Red Sea (1634) in the Gallery's collection was a favourite. Amor also remembers Brack saying "He thought all the best art happened in art movements prior to the Second World War. After that the best art was made by independant artists". Life class was Brack's domain and Amor says "John could be quite unnerving, very witty and sarcastic, when he came around and looked at your work. His comments were usually pretty right, though." Above all, Brack encouraged his students to be watchful. "John reckoned you should be able to find your subject matter a mile from your door," Amor says. The teacher led by example, ambling along city streets and spying incongruous objects in shop windows. "Those objects came into John's paintings," Walker says,"with John (appearing) in some of them." Walker often lunched with Brack at an Italian restaurant in Carlton. "The food was beautiful", he says "but the ambience was a bit spooky. You never saw the owners, they were always out the back. There was just this lonely stout daughter taking the orders and doing the till. It was so Brackian. I could almost see John thinking about the scene in an existential sort of way." Brack was a formative figure for Amor. Revisiting his own post-art school paintings, he admits: "The way they're composed, the semi-charicatured self portraits ... all that is very much Brack." But Walker says imitation was the last thing Brack wanted. "A lesser artist would have wanted minions and devotees. Not John. Where he did influence things was in the area of professional practice." Amor agrees: "John did give us a sort of moral compass, which was unusual. There was also the idea that you only showed your best work. You never showed trifles." In 1968 Brack left the Gallery School to take up painting full-time. The next year, satirist Barry Humphries urged the artist to paint a portrait of him in the "character of Mrs Everage". "John accepted the challenge,"Humphries tells me, "and I went around to his house several times for the sittings. "At that time, Edna favoured Thai silk, the colours of peacock green and cyclamen with a feature called a flyaway panel - a sort of built-in scarf of the same fabric that could be flung over the shoulder. The pearls were plastic poppers. "Brack liked the Thai silk because he enjoyed solving the problem of painting a fabric that changed colour from different angles. Half way through the portrait, he groaned "This is horrible," he complained. "Absolutely horrible." "Don't worry John," I replied. "If it's not working, I quite understand. My fault for suggesting it." "Oh no!" he exclaimed. "It's wonderful. Horrible is my highest term of praise." Brack's donnish wit was mistaken by some for rudeness. "John was very funny in a manner that used to called 'dry'," Humphries says. Senbergs chuckles: "John wouldn't stand for any arty bluster or theorising too much." But those who earned Brack's respect were rewarded with loyalty. In the early 1970's, Amor was "pretty broke and moving house with wife and baby." "I knew Brack often helped his ex-students, so I rang him and said, "Could you sell a painting for me?" Soon afterwards, art collector Joseph Brown "turned up and bought a couple. Then, through Joe, I met Clif (Clifton Pugh) who sort of prevailed on Joe to support me. John started it all". Senbergs met Brack 10 years earlier. "I had a basement studio in Hardware Lane, a damp, bleak place it was," he says, "and John came in and bought one of my first ugly Dulux and masonite pictures. Never forgot that." Nineteen years apart in age, Brack and Senbergs forged a firm friendship. "When you met, the first thing John wanted to know was what you were reading," he says. "You never talked too much about what you were going to do. It was always, what you'd done." Brack followed a routine that saw him work at his home studio, six days a week. He did not drive and only visited Europe once. Senbergs says: "John was probably the least travelled artist but he was the most informed and had a terrible sense of what was going on around the place." Into the 1980's Brack retained his maverick status with cryptic paintings teeming with pencils and postcards. Scrutisining these "visual meditations on humanity, history and civilisation". Kirsty Grant sees a recurring idea "that the mistakes made by one generation will not necessarily be avoided by the next". "I tend to think that there's more emotional life in his (Brack's) work than people give credit for." Brack often told peers and students: "You have to make things difficult for yourself. You have to paint a masterpiece every now and then." But when I met Brack, in 1994, his willpower was fading. "When you're 40 there's always another horizon,"he told me. "You might think what you've just painted is mediocre but you think, one day I'll do it. Not now". John Brack died in 1999, aged 78. Senbergs says: "I miss him terribly now because he was a sort of artistic conscience to a lot of our generation." Walker especially misses the conversations at the Cathedral Hotel in the days of the six o'clock swill. "John used to say Melbourne was the place for art, Sydney was just ...decoration." Then, before the barmaid could say "Time, gentleman please", Brack would empty his glass and hurry out the door. Australia's most enigmatic artist had a train to catch.